In a few short years the web has become so familiar that it is hard to think of life without it. Along with that familiarity with browsers and bookmarks goes a little knowledge about the web's history. Many users know that Sir Tim Berners-Lee developed the web at the Cern physics laboratory near Geneva . But few will know the details of the world wide web's growth - not least because the definitive history of how that happened has yet to be written. 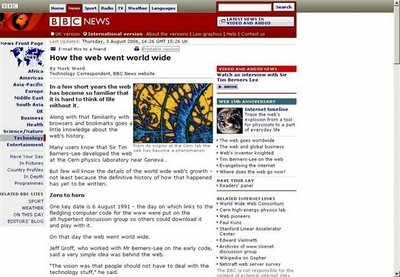 One key date is 6 August 1991 - the day on which links to the fledgling computer code for the www were put on the alt.hypertext discussion group so others could download it and play with it. On that day the web went world wide. Jeff Groff, who worked with Mr Berners-Lee on the early code, said a very simple idea was behind the web. "The vision was that people should not have to deal with the technology stuff," he said. The web was an overlay that tried to hide the underlying complexity of the data and documents proliferating on the internet. Early on this commitment to simplicity meant that the now familiar addresses beginning http:// were never seen. In the early 90s a single way to get at the information stored on many different computers was very attractive, said Paul Kunz, a staff scientist at the Stanford Linear Accelerator Center (Slac) who set up the first web server outside Europe in December 1991. At that time, he said, computers were islands of information. A login only gave access to that machine's resources. Switching computers meant logging in again and probably using a different set of commands to find and retrieve data. The web really caught Mr Kunz's interest after Tim Berners-Lee showed it querying a database of physics papers held on an IBM mainframe. "I knew what the results should look like on the screen and the results looked identical in the web browser," said Mr Kunz. The web server set up by Mr Kunz let physicists trawl through the 200,000 abstracts more easily than ever before. This proved so useful that soon even Cern scientists were querying the database via the Slac webpage rather than using the copy on their network. But though physicists were being won over by the web's promise, in the early years few others grasped its potential. This was because, said Mr Kunz, many other technologies existed that did a similar job. Many people got hold of key documents using the File Transfer Protocol (FTP) and used Usenet as a means to express themselves. Particularly popular was a technology known as Gopher developed at the University of Minnesota that also put a friendly face on the blooming complexity of the computers connected to the internet. It got the name partly because the college's sports team is called the Golden Gophers. Gopher was released in Spring 1991 and for a few years statistics showed far more gopher traffic was passing across the net than web traffic. During this time Mr Berners-Lee, Jeff Groff and colleagues involved in the world wide web project were evangelising their creation at conferences, meetings and online. The whole project got a boost in April 1993 when the first PC web browser appeared. It was created by Marc Andreessen at the National Center for Supercomputing Applications at the University of Illinois rather than at Cern because, said Jeff Groff, the web team did not have the staff available to write browsers for PCs, Macs or Unix machines. Mosaic was so successful that it established many of the conventions of web use still around today, said Mr Groff. For instance, he said, the original conception of the web had no place for bookmarks or favourites. Also in 1993, the University of MInnesota began charging for Gopher which led many people to consider alternatives far more seriously. Ed Vielmetti, a pioneering web user and now a research associate at the University of Michigan School of Information, said during these early years the technology really started to prove its usefulness to average net users. Gopher and FTP systems were typically set up by companies or large institutions, he said. Also Usenet lacked any kind of persistence so anyone making a point had to re-post their opinions regularly. Early on people started to use webpages as a way to express themselves in a way that other technologies simply did not allow. Mr Vielmetti said web code was very tolerant of mistakes and encouraged people to play around with it. "Websites filled this unique little niche for you as a person, not as a corporate entity, and you can have the page sitting there and have it be yours," he said. Every surge of interest in the web has been driven by the appearance of tools that make this expression, or a new type of it such as blogging, far easier than before. The foresight of Mr Berners-Lee and the pioneering coders was such that, even today, many early webpages can still be viewed. That persistence can last decades. "The killer application for the PC was the spreadsheet, for the Mac it was desktop publishing and for the internet it was the web," said Paul Kunz. He added: "Tim Berners-Lee was working on a problem to solve in high-energy physics but in finding a solution he found a solution to problems that the general public did not know they had." In late 1994 web traffic finally overtook gopher traffic and has never looked back. Now there are almost 100 million websites and many consider the web and the net indistinguishable. But, said Mr Groff, only now is the web meeting the vision that the pioneers had for it. The original conception was for a medium that people both read and contributed to. New tools such as photo-sharing sites, social networks, blogs, wikis and others are making good on that early promise, he said. The web may be worldwide but it is only just getting started.